MANILA, Philippines - Filipino Pride Manny 'Pacman' Pacquiao edged out the World Boxing Organization (WBO) Junior Welterweight Champion Chris Algieri via unaninous desicion in the WBO Welterweight Title Match on Saturday, November 22, 2014 (November 23 Philippine Time) at the Cotai Arena, Venetian Resort, Macau, China. Pacquiao retains his welterweight crown with a dominating unanimous decision win over Algieri with the scores: 119-103, 119-103 and 120-102. The crowd cheers as Pacquiao finished with a celebratory shuffle of his feet after the final bell. At the 12th round, Algieri gave a game performance, but Pacquiao was smothering him and landing whenever he wants. Pacquiao was stinging Algieri with hard shots at round 11. The Filipino champ looks calm, relaxed as he went about his work to defend his title. Pacquiao turns Algieri's head to the side twice in a row with brutal punches. Round 1: Algieri is working the outside and pumping his jab, but Pacquiao has slipped in several times and landed. Round 2: Pacquiao attacks and plants Algieri, who complains it was a slip. They're back at it. Hard left lands for Pacquiao, as Algieri circles away. Round 3: The crowd is changing "Manny" as Algieri flees a Pacquiao onslaught. Algieri lands a shot but Pacquiao shakes it off and resumes coming after him. Round 4: Pacquiao is tagging Algieri, who's trying to keep him at bay with the jab and movement but isn't having much luck with either. "Evidence in this round so far suggests that @MannyPacquiao wanted to focus on body shots and he has done so." Jim Lampley said. Round 5: Pacqquiao is connecting here. Then Algieri is warned against low blows. Round 6: Pacquiao lands a one-two, Algieri sticks to the outside and flicks the jab but he's not throwing much else. Pacquiao buzzes Algieri, then sends him flying across the ring. He's down for the second time. Algieri gets up and then gets dropped again shortly after. He's back up and they're back at it. Round 7: Algieri throwing a greater variety of punches here but Pacquiao is right on top of him. Round 8: Pacquiao goes after Algieri, who reels backwards and resumes flicking out the jab and circling. Round 9: Pacquiao is putting together combinations. 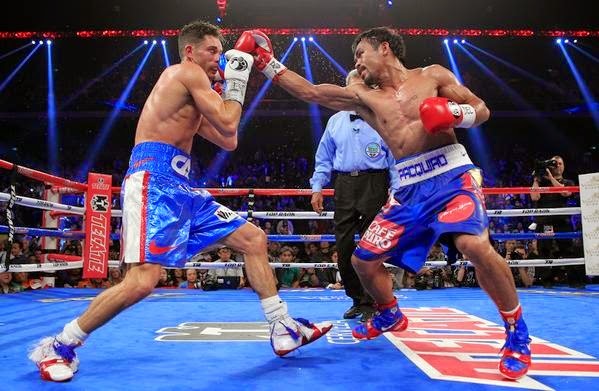 Every now and then, Algieri will stick a shot but nothing has slowed Pacquiao. Pacquiao spent the last 30 seconds of this stanza pummeling Algieri. Somehow, the native of Long Island survived. Round 10: Pacquiao is landing more or less at will here. Algieri is unable to keep Pacquiao off him. Algieri is down again. He gets up and survives again.